As man carries out his day to day interactions with his fellow man, there is likely to be strife and disagreement amongst them. This necessitates the need for a process of resolving these disputes. This is where the judiciary comes into play. The judiciary is the body of judges in a jurisdiction that administers justice according to the laws of the land. As law students, some of which are likely to end up being judges, it is pertinent that we study the way legal reasoning in the judicial process occurs. In dealing with the subject of legal reasoning in judicial process, I shall be highlighting on the shifting of fact, shifting of law and judicial precedent. The facts of a case are the versions of the story that has been accepted by the court after being satisfactorily proved by the party on whom it lies to be proven. Different parties at different times would have to establish their own version of the fact before the court. The process by which the responsibility of proving the fact moves from one party to another is called the shifting of fact. In civil cases, the initial burden of proving a set of facts lies on the plaintiff. If after proving his facts, the defendant disagrees with the plaintiff’s version, the defendant would have to prove his own story. If the facts in issue are admitted by both parties, those facts would be accepted by the court. Thus, according to the provision of S.136 (1) of the Evidence Act 2011, the burden of proving any fact lies on the person who wants the court to rely on those set of facts. In criminal cases, the burden rests on the prosecution to prove its case beyond reasonable doubt. The burden of proof doesn’t normally shift to the accused. This is backed by the provision of S.36 (5) of the Constitution which provides that in a criminal case, an accused would be presumed innocent until proven guilty. Where the accused raises the defence of exemption or qualification from the provision of law creating that offence; 139 (1) Evidence Act 2011. Where a statute specifically places the burden of proof on the defendant. Where special facts are within the knowledge of the accused; 140 Evidence Act 2011. Where the accused raises the defence of intoxication or insanity. Shifting of law occurs in a situation in which one party relies on a law that is either inapplicable or out of date. The burden of bringing this to limelight rests on the party that knows about this flaw. If none of the parties know about the flaw in the law, the burden of bringing this to limelight shifts to the judge. This is due to the fact that juria novit curia (The court knows the law). Also, ignorantia judicis est calamitias innocientis (the ignorance of the judge is the calamity of the innocent). Judicial precedent originates from the principle of stare decisis which means ‘let the decision stand’. It means that similar cases must be treated alike. The reason for this is to achieve uniformity and certainty in the administration of justice. 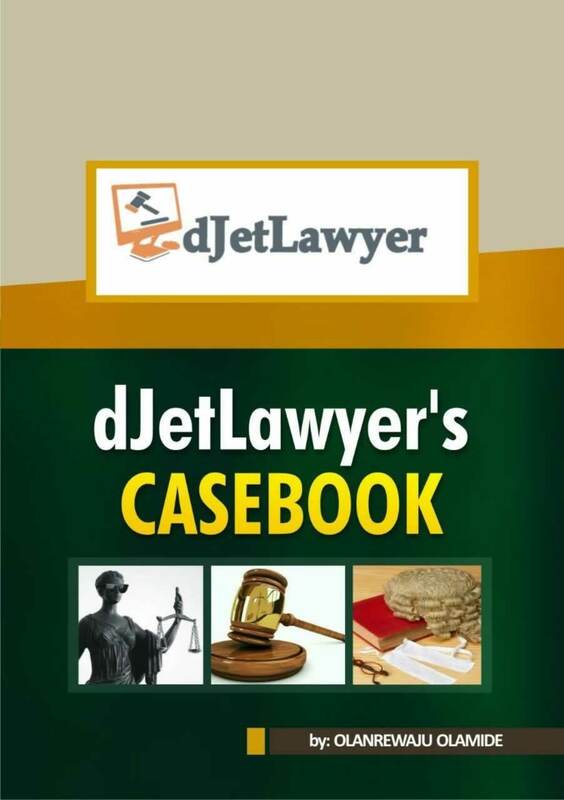 Judicial precedent has been defined in the case of Global transport vs free enterprises Nigeria limited (2001) 2 SCNJ [email protected] as a golden rule in which decisions of higher courts in the land are binding on lower courts. And decisions of courts of co-ordinate jurisdiction are for all intents and purposes binding between these courts except if the previous decision was made per incuriam. It’s not all the aspects of the judgement that are relevant in determining the principle decided in a court. It is the ratio decidendi that is relevant in determining the judicial precedent. However, the other parts of the judgement are not entirely useless. The other parts of the judgement are referred to as obiter dictum. Although an obiter dictum is not really a present judgement, in a later case, it can be adopted as a ratio decidendi. With all these, can it then be contended that judges make law? Yes, by all means, however, their law is not legislation because it wasn’t passed by the national assembly. Also, judicial precedents can either be binding or persuasive. Decisions made by court of higher jurisdiction are binding on courts of lower jurisdiction. However, decisions by court of co-ordinate jurisdiction are persuasive. The hierarchy of courts is the arrangement of courts in the method through which appeal flows. If judgement at the lower court is not satisfying, appeal can be made to the higher court in order to get redress and justice. I would highlight the courts starting from the lowest. This is just a single court, it transforms to a magistrate court in the hearing of a criminal case while in the hearing of a civil case it becomes a district court. These are courts that are regarded as courts of inferior jurisdiction. There are a two adduced reasons for this. Firstly, it is not listed among the courts in S.6 (5)(a) – (i) CFRN 1999 as amended. And section S.6 (3) provides that the courts that are mentioned in the previous section are courts of superior record. By implication, courts that are not mentioned are courts of inferior record. The second reason for this is that they cannot punish contempt ex facci curria. The decisions of magistrate courts are bound by decisions of the higher courts but their own decisions do not bind any court. Also, they are not bound any of their previous decisions. Directly above the district/magistrate court are the High Courts, Customary Court of Appeal and Sharia Court of Appeal. Pursuant to S.6 (5) CFRN 1999, we have the Federal High Court, State High Court and High Court of the Federal Capital Territory. Of these three, the State High Court has the widest jurisdiction. It should be noted that Customary and Sharia Courts of Appeal are not bound by judicial precedent. This is because they are not of common law origin. Also, they hear appeal on cases from the Area courts. While the High Courts hear appeals from the magistrate court. These courts are referred to as courts of co-ordinate jurisdiction therefore they are not bound by previous decisions of another High Court. At best, the decision of one High Court is persuasive on another High Court. However, it is not expected for a High Court to depart from another High Court’s decision except in good cause. A State High Court has wide jurisdiction unlike a federal High Court which has a more limited jurisdiction as provided in S.251 of the constitution. Thus, if a state High Court makes a decision on a matter of federal application, it binds all magistrate courts in the country. If it makes a decision on matters of state application, it only binds courts of inferior jurisdiction in the state. Directly above the High Court is the Court of Appeal. There is only one Court of Appeal in Nigeria but it has different divisions over the country. Thus, decisions by the Court of Appeal in Ilorin division is treated as its own decision in the Court of Appeal Lagos state. The question then is how does the Court of Appeal deal with judicial precedent? If there are two or more conflicting decisions of different courts of appeals, it can follow either of them or choose to follow none of them. When a decision of a Court of Appeal is in contrast with a decision of the Supreme Court. However, in criminal matters, a Court of Appeal is not bound to follow the decisions of other courts of appeals. This is because of the very nature of criminal law in which each cases should be treated on its merit. Strictly following a previous decision could lead to irreparable damage. This may be due to the fact that it is better for the court to set free 10 guilty persons than to convict a single innocent person. This is the highest court in the land and its decisions on any matter is final S.235 CFRN 1999. Its decisions are binding on all courts throughout the country. If the previous decision is given per incuriam. In the case of Bucknor Maclean vs Inlaks Nig Ltd  the court departed from its decision in two previous cases: Shell BP vs Jammal Engineering ltd and Owumi vs Paterson Zochonis and co Ltd due to the fact that adherence to these precedents could lead to substantial injustice. If following the previous decision would lead to substantial injustice. When a legislation nullifies the decision made in the previous judgement. If it is faced with two previous conflicting decisions of its own, it can choose to follow anyone. In the case of Odi vs Osafile the court reasoned that the law was made for man and not man for the law. Also, man isn’t infallible and so are his thoughts. Therefore if it is pointed out that there has been a substantial error in a previous decision, the court should have the jurisdiction to correct that decision. Constitution of the Federal Republic of Nigeria 1999 (as amended). Please could you explain literal rule, Golden rule and Mischief rule of conduct. What area isn’t clear to you? it was sooooooooooo badddddd because i did not get all the answers. The explanation was not comprehensive at all. in addition, obiter dictum wasnt explained at all. Hello. What answers are you talking about?